I recently traded in my Erica Synths Pico Drums for a pair of TipTop Audio ONE Sample Playback modules. I did this because I wanted more immediate and hands on control over samples in a live performance, and during sound design. I suppose in the end I’ll be wishing for a 1010 Music’s Bit Box for 8 samples at once, but for my small 84hp 7U case, space is vital, and I’ve elected to curate my modules tightly, and get the absolute most out of what I have at all cost. Thus I don’t collect, nor do I plan to end up in a basement filled with Eurorack modules while no one even remembers I live here. As fun as that sounds, I have chosen to be as portable, and inclusive as possible. I keep what comes with me, and I don’t maintain a cache of alternatives. What I show up with is what I have, and I use everything I have. So I wanted a pair of samplers for my case that would allow me faster, easier, and more satisfying manipulation of samples in real time. It’s only been a day so I dunno yet, but I immediately love the sounds I’m making, and drew up this little cheat sheet to help keep my computer completely closed and away from me while I’m making music. It’s turned out to be a useful learning guide, and I hope it helps you too. I’ve learned a few things in the last 24 hours, and most importantly for those of us who like little files – percussion sounds, errors, and single cycle waveforms – the best response comes from the ONE when the files are about a second long, or longer. If you’ve had that curious and troubling effect of sounds not playing at all, or sounding like they are overlapped or somehow all messed up, what’s happening is the files are too short. So they are overlapping and it’s all going to hell. The solution is to follow the suggested instructions and download Audacity for free (maybe don’t grab the most recent version because they’re known to be so under development that the latest versions typically crash a lot – at lest it does on a Mac) and then take your tiny file and either copy some silence and extend the file to be about 1 second long (great for a percussion sound) or loop the file so that it’s about 1 second long (better idea for single cycle waves and anything you’re hoping to seamlessly loop.) It’s probably also a good idea to go through the hassle of clearing the headers from the WAV files too. This makes the files leaner and meaner and easier to work with in the module. What happens is ONE is able then to distinguish better between your files and they play more autonomously. This makes for better sound separations and clearer samples. Now conversely you may want to create a mess. I wouldn’t blame you one bit if you did. So consider that little tiny files make a mess inside of ONE. Try chopping some beautiful vocals into teensy slices and playing them in a playlist? Crazy fun. Yes. 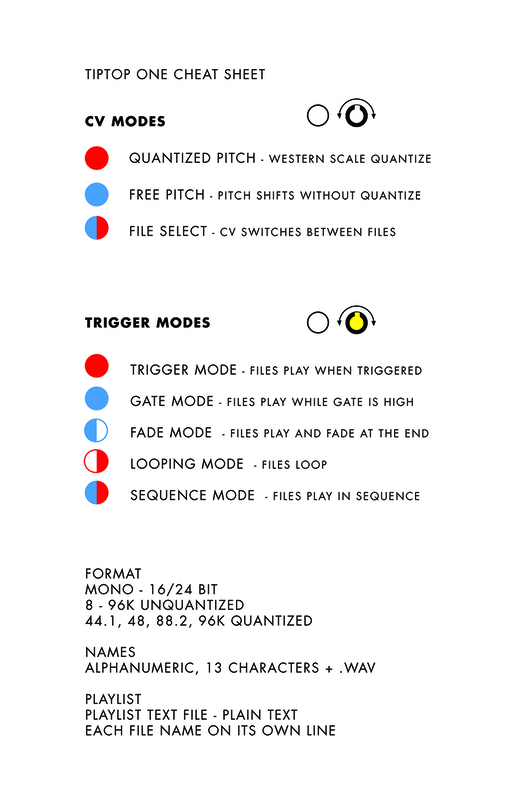 Unless you’d like an 8.5 x 11 copy of this cheat sheet I suggest you use the following print dialog instructions to create a 1/4 size version to keep at hand while you’re learning the here’s and there’s of the ONE Eurorack sample player module. 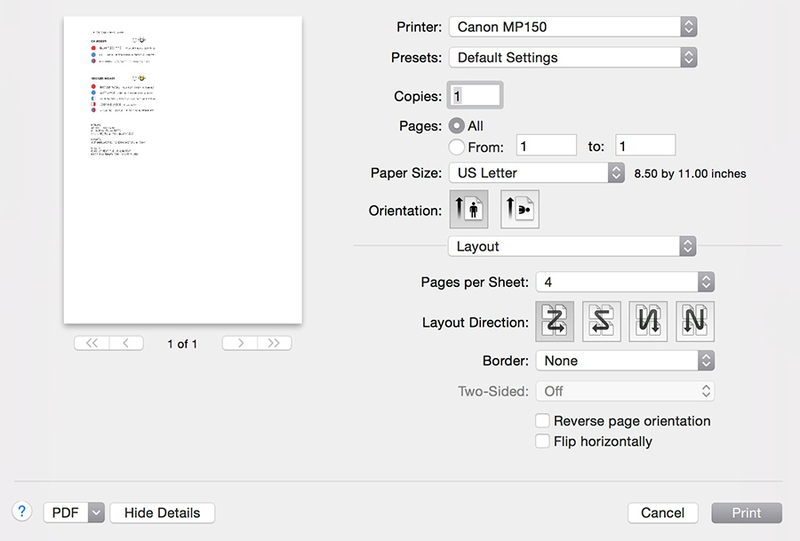 In your print dialog, choose layout and 4 pages per sheet. This will reduce the pdf to a quarter size and allow you to trim a nice, tiny little reference guide.